The A5 is the road running from Marble Arch in the centre of London to the port of Holyhead in Wales. Much of it is very straight, and identical with the Roman road from London to Wroxeter, known often by its Anglo-Saxon name of Watling Street. When it was completed by Thomas Telford in 1826, as a Government-sponsored project to connect the capitals of England and Ireland, it was, it has been said, the first great state-funded piece of civilian road-building in the UK since Roman times. As one of the oldest roads in Britain, and one of the longest and straightest in a nation of mostly wiggly roads, it has exerted a considerable fascination on all sorts of people down the ages. More or less immediately from 1826 it became identified closely with the migration of Irish people into England in search of work, and the section of the road in London, and adjoining districts, became the settling place of large numbers of them, in the suburbs of Colindale, Hendon, Cricklewood, and especially Kilburn, famous for its concentration of pubs along the Kilburn High Road section of the A5. Down to modern times, the Crown pub in Cricklewood (where Brent Cyclists meets in even-numbered months) was known as the hiring station early in the morning for casual labour, particularly for the building trade, traditionally Irish, but in recent decades more commonly East-European. The famous Crown in Cricklewood Broadway, today gone quite up-market. John Betjeman praised its "terracotta shade". It almost makes you like planning, doesn't it, for the lack of it. Look! They've put a car park on the site. They needn't have taken it down at all! (on the destruction of the Metropolitan Pace of Varieties, a Victorian music hall). 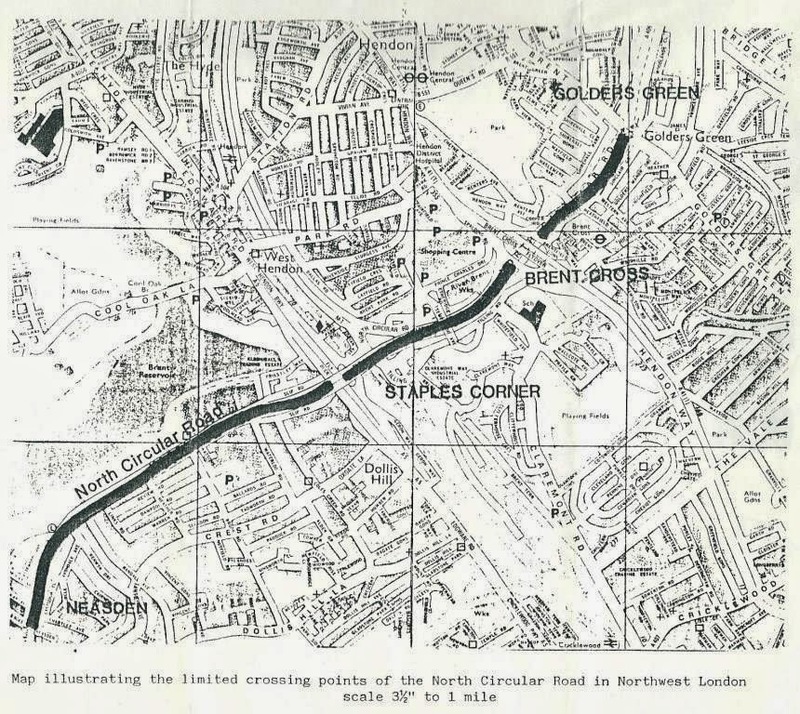 He recorded his nostalgic view before the building of the concrete flyovers and gyratories on the A5 at Staples Corner, that destroyed the Old Welsh Harp pub and definitively ended the quasi-rural seclusion of the Brent Reservoir. The sign of the times that he did witness was the then brand-new office block Merit House, Colindale, from the top of which he viewed the vestigial Middlesex countryside. It is still there, a drab, unloved monument to its decade and to "planning" that dumped huge, isolated blocks in the middle of a low-rise decaying industrial suburban hinterland. The Merit House office block that Betjeman visited in 1968 interrupts the car showrooms on the A5 in Colindale. Opposite is a building site that will soon be high-density housing. In London, most of the length of the A5 is a local authority boundary. This has been the case since at least mediaeval times; the old parish boundaries were usually taken over as borough boundaries. From the southern end of Kilburn High Road to part of the way along Cricklewood Broadway the road forms the boundary between Camden and Brent. From there north to Burnt Oak it forms the Brent–Barnet border, with the exception of the Welsh Harp "village" area, where Barnet has taken the land on the east bank of the Brent Reservoir, so holding both sides of the A5 in West Hendon Broadway. From Burnt Oak northwards, the road forms the Barnet–Harrow border. This status as a borderland has undoubtedly contributed to the generally shabby, often hostile urban environment of the A5. No planning authority really cares that much about the town centres that have sprung up along the route. Responsibility for them is divided, and a general lack of collaboration and poor planning means they have a neglected, "wild-west" character. This is especially bad for the centres that are divided three ways: Cricklewood, divided one quarter each between Camden and Barnet, and half in Brent, and Burnt Oak, divided one quarter each between Brent and Harrow, and half in Barnet, but it also applies to Kilburn, Colindale and Edgware. The nicest part of the A5 is, I think, not coincidentally, Maida Vale, where Westminster rules both sides. Away from these crumbling Victorian and inter-war shallow linear town centres, the A5 has been the urban territory to which the ugly things that make money and have to be allowed to happen somewhere in London get pushed: the retail sheds, mega car showrooms, every type of automotive servicing works, industrial buildings, waste recycling. A view of the A5 at Burnt Oak, looking south. This is motorland; nearly every block is occupied by some motor-transport-related business. Note the vast, unused pavements and lack of space for cycling. For cycling in north-west London, the A5 is a critical artery, as it is the straightest route from all the suburbs along it to the West End, and also, due to severance by railways, bigger roads, and water features, basically the only possible route between those suburbs. As a trunk road, the A5 is completely bypassed by the A41. The A41 is the Transport for London (TfL) main route out of north-west London, and is far more suitable for lorries and coaches than the frequently narrow A5, which goes down to a total width of less than 9m (including pavements) at the pinch-point just south of the junction with Willesden Lane in Kilburn. But, of course, as nothing prevents long-distance through traffic from continuing to use the A5, despite its official "bypassing" by the A41, it is generally clogged with lorries, buses, private cars and delivery vehicles. Notionally designated as the LCN+ (London Cycle Network Plus) 5 route by ex-Mayor Ken Livingstone's cycling development team, there is absolutely no meaningful cycling infrastructure along the whole length of the road in Greater London (unless you regard the very part-time and discontinuous bus lanes that cyclists can use as "cycling infrastructure"). There are a few blue signs giving mileages, and a few bike logos painted on the road in odd places. I spent a day, with other cycling representatives, some time about 2008, going up and down the A5 with consultants for the LCN+ and council officers, assessing what could be done to make the road better for cycling. None of our suggestions were ever acted upon. The money was wasted, or disappeared, and the project was abandoned. After Boris Johnson announced his replacement Cycle Superhighway programme, it was suggested that Cycle Superhighway 11 should be on the A5, but this was later changed to the A41 (and we still await for it to actually happen there). Little came of the LCN+5 project on the A5 other than these blue signs. This picture, taken at the Capitol Way / Edgware Road junction, shows the demolition of the Boosey and Hawkes warehouse, opposite, the site now being developed for high-density housing. The A5 from Edgware to Marble arch remains a long series of left-hook hazards for cyclists, with junctions apparently designed to put them in as much danger as possible. The few of them that use it do so because the Roman engineers and Thomas Telford between them knew what they were doing. They built not only a very straight, but a very flat road though quite a hilly area. All other possible routes from Edgware to the centre of town are not only longer but far hillier. So for cyclists attempting to do this journey, or sections of it, there is little other option. They must trade directness and flatness for the terrible environment. The "high street" sections of the A5 are classic examples of the kind of chaotic UK street environment where everything is attempted to be fitted in simultaneously: shopping, parking, loading, pedestrian movements, bus stops, cycling, plus heavy through-traffic including freight, and it doesn't work very well. There was a Street Talks meeting organised by the Movement for Liveable London in April on The roles of place and movement in creating successful high streets in which one of the contributors, Louise Duggan, of the Greater London Authority, spoke of the conflicts between the "place and movement" functions to be managed in London's high streets. I asked if there should not be, in preference to the permanent toleration of poor public spaces and a continued stream of pedestrain and cyclist casualties, a long-term policy to remove these conflicts as far as possible. I was thinking of streets like Kilburn High Road and the other"high street" sections of the A5, where local authorities' intermittent attempts to create a better environment always seem to meet a sticky end because they cannot resolve the fundamental conflicts between the arterial, business and social functions of the road. In short, if the road continues to carry masses of heavy traffic, it cannot be a nice place to be. Ms Duggan responded that she did not think it was possible to separate out the functions of roads and streets (so she has obviously a limited knowlege of how they do things in other places), and, even more startlingly, stated that conflict that was one of the things that people liked about cities and attracted them to them. This caused some amusement, or amazement, in the audience. Kilburn High Road (Google Earth photo) at a quiet time. The cycle logos do a lot of good. About a year ago I attended a meeting to look at some new plans, the latest in a long sequence I have witnessed over the decades, jointly put forward by Brent and Camden, in yet another attempt to "improve" Kilburn High Road. Yet again it was a proposal to mess about with kerb lines, number of lanes, and junction arrangements, with, in this case, the addition of some kind of median strip in some places. Of course, there was no dedicated space for cycling in the plans, and nothing that would actually reduce the through-traffic. The planners had come up with some curious designations for the road they were dealing with: arbitrary subdivisions of what is actually just a long, continuous slug of two, three and four lane road lined with shops. There was a "northern gateway", a "cultural area" (because there is a well known fringe theatre there, the Tricycle), a "secondary town centre shopping area" , a "primary town centre shopping area", and a "southern gateway". Nobody locally would have recognised these designations, the person drawing the plans had just made them up. I said, well, OK, if this is what we want, let's actually have these separate areas. Let's turn these sections into separate areas of street that traffic, apart from buses and bikes, cannot move between. It could be done with a combination of mode filters and one-way sections and circuits using other streets. We could eliminate the heavy through traffic. Then we could genuinely create these areas with separate character and function. But we can't do that if everything else is over-ruled by the need to have heavy car and lorry traffic thundering through night and day. That is what fixes the character of the High Road, overwhelmingly, and makes these fanciful designations, and attempts to create an improved environment, in the end, a bit of a nonsense. Needless to say, that suggestion went no-where. The A5 is a big road for through-traffic. That's how it is, and nobody but me could conceive that that could ever be changed, within the bounds of political reality. Strangely, though, some years back, Kilburn High Road was actually completely closed to traffic for about six months (I may remember this wrongly, but it was for a substantial length of time) for reconstruction of the bridge across the West Coast Main Line. And, strangely enough, it became a pleasant, thriving and bustling place at that time (apart from the difficulty pedestrians and dismounted cyclists had with passing through the narrow gap in the building work that was left for them), and the economy of the area did not collapse. In fact the shops appeared to do well. Most of the time there actually seem to be utility excavations on Kilburn High Road which reduce the number of lanes or cause alternate working using temporary traffic lights. Yet the idea of permanently severing the general through-traffic artery of the A5, and forcing that traffic to use the six lane A41 (which was purposely widened in the 1970s exactly to make it that principal traffic artery through north-west London), seems to be inconceivable. So we just have an endless succession of minor schemes down the years to tweak a very ugly, and dangerous, borderland environment, that never tackle the central issue: that if we want proper town centres, if we want vibrant commercial districts and good public, social spaces, then most of this traffic cannot remain here. We get tree planting, we get benches, we get weird new lamp columns designed by the art students, we get more bollards, we get railings put in, then railings taken out (according to the fashion at the time), discontinuous, ineffective bus lanes put in, bus lanes taken out again (according to the political fashion of the time), and the environment of the A5 remains as it always has been: noisy, dirty, dangerous, shabby, and unappealing. Cricklewood Broadway, slightly wider than Kilburn High Road but just as congested and chaotic, with sheep-pen crossing for pedestrians and a mass of railings to prevent them from crossing in wrong places. The railings, however, provide the only available bike parking. Note the roadworks, seemingly ever-present, taking out lanes on the High Road or the Broadway. 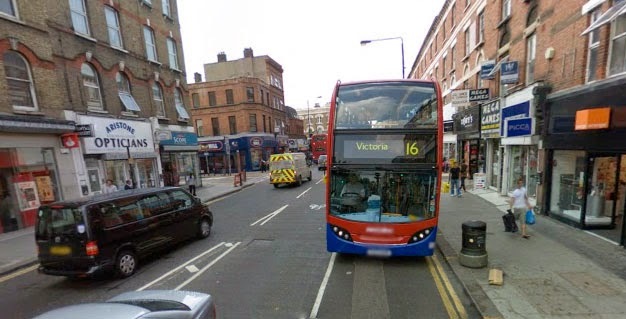 Kilburn High Road is too narrow to support separate cycle tracks while maintaining the two-way general traffic flow, but it is a critical section of road which makes the point, that I am always stressing, that we need to sort out the purpose of our city streets. We can't have critical streets which have so many functions in conflict, and putting in the sort of cycling infrastructure that will support mass cycling, in the Dutch sense, requires that we tackle this issue of purpose first of all, determining where the priority cycle network, the priority bus network, and the general traffic network will be, and separating them by route in places where separation on the street is not possible, as in Kilburn High Road. In Maida Vale it is a different story. The road has excess width, and, since Kilburn High Road is the bottleneck, space here could easily be reallocated to cycling, were the political will to do it present in Westminster Council. General traffic does not need more than one lane in either direction, as it will just come to a grinding halt again on Kilburn high Road, going north, or on Edgware road, going south. Maida Vale and the Westminster Edgware Road suffer, like all roads in Westminster, from a stupid excess of signalised junctions, which make a journey down them, by any mode, extraordinarily inefficient and tedious. The Dutch only use signalised junctions as a last resort; they close far more side-roads off than we do, to restrict and rationalise the through-traffic network and make it more efficient, with fewer delays. Westminster puts traffic lights everywhere, to cause maximum frustration to all road users and create the least efficient surface transport network possible. The chaotic character of the A5 so familiar from Kilburn High Road and Cricklewood Broadway, is soon re-established in the southernmost, Westminster section of Edgware Road, between Maida Vale and Marble Arch, where the lack of space to cycle in is compounded by the junction restrictions and one-ways which seem designed to make it almost impossible to access form the A5 areas more pleasant for cycling, such as the Hyde Park cycle paths or the Grand Union Canal. The junction of Edgware Road with the slip roads leading to Marylebone Road and the A40 (at Edgware Road tube) is the biggest hazard for cyclists on this stretch. As I pointed out before, Westminster's proposals for the "Central London Cycle Grid" absurdly try to circumnavigate this problem rather than deal with it. Looking northwards up Edgware road towards the Marylebone Flyover. No space can be found for cycling here, obviously. The Cycling Grid proposes an impractical "Quietway" detour round the junction. South of the Marylebone Flyover, we are in the final stretch of the A5, "little Arabia", where the latest hazard I have come across, on top of all the buses, lorries, black cabs and white vans, is the inconsiderately-driven electrically-assisted rickshaws, broadcasting loud Arabic music, darting across the road unpredictably to collect passengers from the next hookah joint, particularly at night. These surprisingly powerful, fast-acellerating vehicles will catch you unawares if you have not experienced them before; you cannot outrun them on a normal bike. Five miles to the north-west, the A5 beyond Staples Corner West, the flyover-equipped intersection with the North Circular Road between Cricklewood and Hendon, is a very different kettle of fish again. Frequently very wide, with huge acreages of excess wasted pavement filled with clutter or used for car parking, unnecessarily wide vehicle lanes, and service roads used mainly for even more tiers of parking, it could in most places easily accomodate high-grade Dutch-style cycle tracks, were the road to be totally replanned and rebuilt between the building frontages. The Space for Cycling Campaign asks by Brent, Barnet and Harrow LCC groups for the wards adjoining the A5 are uniformly, and rightly, for protected cycle tracks on the road. But with division of responsibility between the three boroughs, Brent and Harrow Labour-controlled, Barnet Conservative, what chance of such far-reaching change being achieved? It would have to be energetically driven by the Mayor and TfL to have any chance of happening. In fact they would have to take control of the process, and probably take control of the road, to ensure any uniformity of execution. There is nothing in the history of the Cycle Superhighways, TfL's recent attempts at priority cycle routes on main roads, or the Mayor's Vision for Cycling that indicates this might happen. But there is the space; it could be a show-case of what London might achieve for cycling. Typical character of the A5 north of Staples Corner. Looking south from Burnt Oak Broadway, Merit House is in the distance. Note the huge total width of the road, the chaotic street furniture, wasted pavement space, car showrooms and betting shops (typical occupants of this stretch). This is a section which was prettified by Brent just a couple of year ago, with repaving and more bollards and trees. It's still a wasteland. Of course, any improvements to cycling either in the northern or southern section of the A5 in London would run into the conundrum of what to do with the motorway-style intersection with the North Circular Road at Staples Corner West, essentially unaltered since it was built in the early 1970s: a junction that makes absolutely no concession to cycling, as the first half of this excellent video by Londonneur tells you. Bow Roundabout in East London has received huge publicity for its terrible design that has resulted in three cycling deaths on Cycle Superhighway 2. Staples Corner West doesn't get this publicity, though it is a very similar design of intersection, with much the same problems, because there's no cycle superhighway here, nor is there ever likely to be one, and cycling levels are very low, suppressed by the barrier of the North Circular that the video speaks of. There are few casualties, because there are not the cyclists here to get killed and injured. It is so dangerous, cycling is almost non-existent in the suburbs from here outwards. I am statistically certain of this. I often cycle into the West End on the A5, a journey of 10 miles from my house, and I place the game of counting how many other cyclists I see. In the middle of a weekday, it is usually between 12 and 20 cyclists in 10 miles, and some of these will be on pavements. Probably 17 of the 20 will be seen on the five miles of the A5 that I cycle south of Staples Corner. There's no sign of a cycling revolution in these parts, and it's easy to see why. Pathetic, confused two-tier cycle "infrastructure" on the southbound A5 slip road leading to Stapes Corner West. The A5 flyover is to the left. The North Circular flyover overlies that. But despite being a three-level junction (four if you count the walkways), so space for cycling can be found on any of the levels. Cyclists have been campaigning for a safe crossing of the North Circular on the A5 at Staples Corner West for at least 30 years. 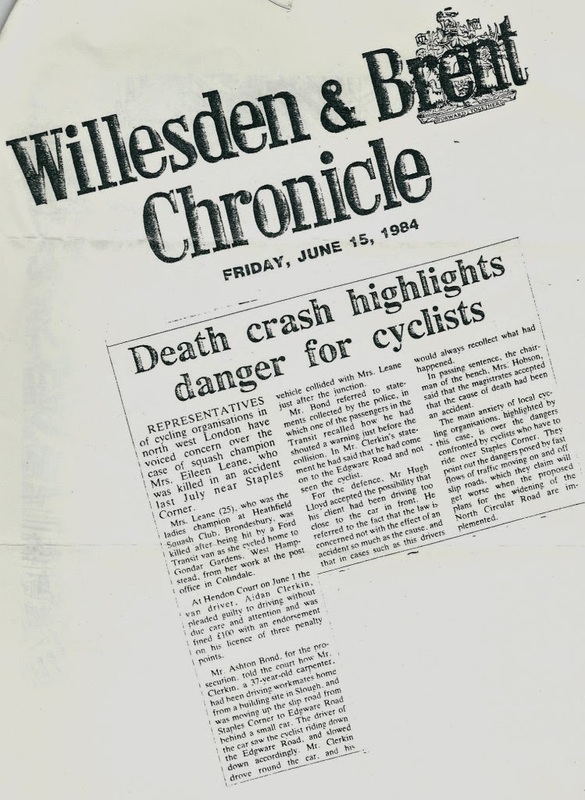 Here is the evidence for that statement, for which I am indebted to Dr Robert Davis, now Chair of the Road Danger Reduction Forum, but at that time representing the West London Division of the British Cycling Federation, now British Cycling. Essentially we were told to work this out with the Boroughs, and that new crossings (I don't know which ones they meant) across NCR would make things safer for cyclists. Such new crossings were never built, neither did the boroughs of Brent or Barnet ever do anything. Precisely nothing has been happening here for 30 years. Something is on the cards today, but it's not what anyone, apart from mega-developers, asked for. Hammerson, owners of the Brent Cross Shopping centre, are pushing for the "regeneration" of a vast area of Cricklewood/Hendon south of the North Circular and east of the A5, connected with plans to enlarge their shopping centre just north of the North Circular. To get as many cars as possible into this without backing-up in large queues on the approaches to Staples Corner, they want TfL to build a huge new gyratory system uniting the Staples Corner East junction (the start of the M1 and intersection of the North Circular with the A41) with Staples Corner West. Those few cyclists who today brave Staples Corner West either cycle illegally on the tortuous pedestrian footbridges, or they use the low-level signalised roundabout that interchanges with the North Circular, or they use the Bow-style flyover on the A5, braving the high-speed merging traffic on the slip roads linking to the roundabout. Most seem to do the latter, as the most efficient option. Southbound slip-road out of Staples Corner West, looking north. The A5 flyover is to the left, the North Circular flyover crosses over that at the top. The miserable pavement cycle track is part of a very poor east-west LCN route; there are no cycle facilities on the commuting axis of the A5. As Brent Cyclists have pointed out, the plans to create this mega-gyratory junction at Staples corner will make a terrible situation even worse, and will even further suppress cycling in outer north-west London. The possibility to take the lower-level route on the signalised roundabout when cycling southwards will no longer be present, that route will lead into the mega-gyratory interchanging with the M1, and no other credible method has been thought up by the developers or TfL of getting cyclists from one part of the A5 to the other. It will be "flyover or die" on the A5 flyover... or maybe both. 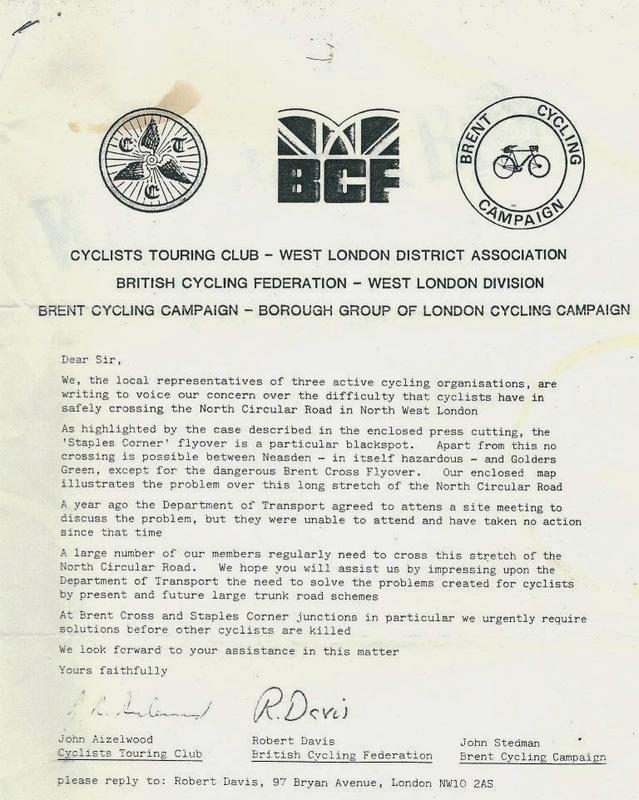 Brent Cyclists wrote to the Development Director Jonathan Joseph earlier this year suggesting some possible solutions to the problem, including signalising a cycle track at surface level through the junction, tunnelling, or new clip-on cycle flyovers attached to the A5 flyover. 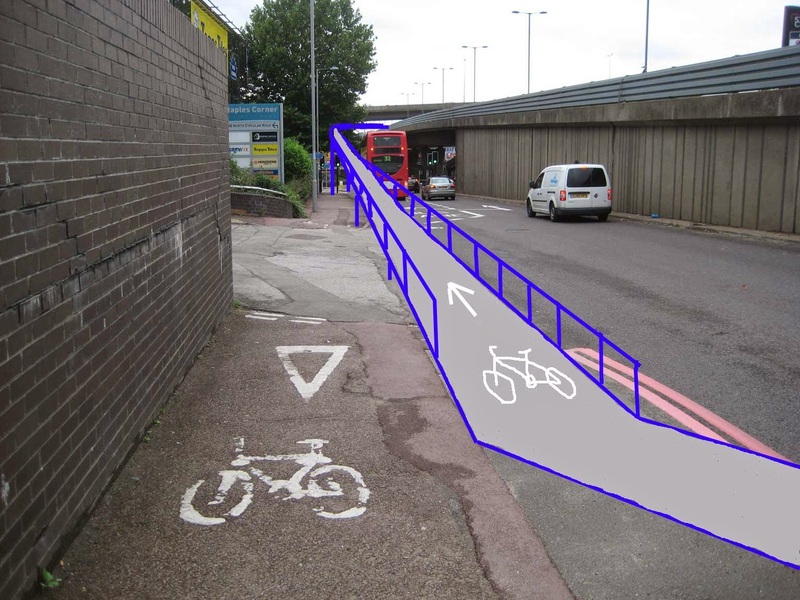 Brent Cyclists' concept for a cycle flyover to bypass the slip roads at Staples Corner West, and clip on to the central section of the A5 road flyover. This may not be the best, or a viable solution, but it is a constructive suggestion. We agree that your second suggested solution of signalling the cyclists through this junction at the lower level would not be viable due to not only the resulting significant delay to other traffic... but also lack of space at this level. ...Segregated flyovers would be less convenient for a longer distance cyclist than simply using the current road flyover. Those cyclist [sic] who are on leisure trips could leave the A5 north of Staples Corner and travel along new north south routes within the Development and re-join the A5 to the south, or vice-versa. So there is likely to be limited use of the new flyover structures which could only be provided at significant cost. 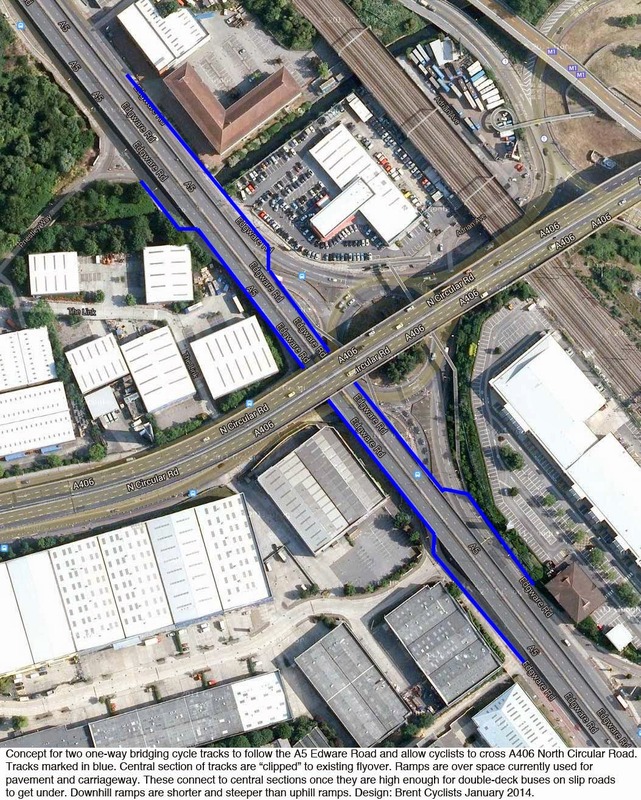 Perhaps some form of segregation over the flyover could be considered by TfL working with the London Boroughs of Brent and Barnet who share responsibility for this route and the existing road flyover. Let's leave aside the Develpment Director's complete failure to understand the need for safe and convenient infrastructure to allow ordinary people to use bikes to undertake short utility trips: for a child attending a school in Hendon to cycle there from a home in Cricklewood only two miles away, for example. It's not his job to understand transport. He has people to advise him on that, but, when it comes to cycling, they clearly do a bad job. The main point is that, once again, as for the last 30 years, those campaigning to for safe cycling on the A5 are pushed from one authority to another, from pillar to post, no-one takes responsibility, and nothing is done. In February there was some publicity from an announcement of Boris Johnson promising to "rip out 33 gyratories" including Elephant & Castle and Swiss Cottage. A closer look at the announcement shows that it is not actually a clear commitment to "rip out" anything, merely to "deliver substantial cycle infrastructure improvements at 33 locations", which could turn out to mean anything, or nothing. I'll believe any of it when I see it. "ripping out" the Swiss Cottage gyratory, on the A41, has been talked of for at least 20 years in my memory, but there has never been enough agreement between all interested parties for anything to actually happen. Meanwhile, there has been no publicity for this plan to create a huge new gyratory on the A5, that will further cripple cycling across north-west London. If cyclists used this new gyratory, they would not only be taking a very convoluted way round, compared to using the direct and almost flat A5 flyover, they would be mixing with traffic getting on and off of the M1 and the six-lane A41 on a multi-lane system that would probably make Elephant & Castle, London's most statistically dangerous junction for cycling, look tame by comparison. The routes through the new development, mentioned by Joseph, will not work either, as they will involve convoluted ramps to get over the North Circular, they will be very indirect compared to taking the straight line of the A5 that the Romans gave us, and they will have sections mixing cyclists up with pedestrians (yes, these are the cycle infrastructure proposals for a brand new development on brownfield land where many of the roads will be rebuilt from scratch). These alternatives will not work, and cyclists will not use them; I can guarantee you that, from having looked at the plans. Neither TfL, nor the Cycling Commissioner, nor the developers, nor the boroughs, have any credible plan by which ordinary utility cyclists will be able to cycle along the line of the A5 after this development is built. It is appalling. Following the Brent Cross Cricklewood developers' cycling "alternative" to the A5 would take you far off your desire line for most journeys that currently use the A5, and eventually, after you had surmounted the ramps over the North Circular and all the shared-use obstacles put in your way, would dump you on the unpleasant rat-run of Claremont Road, with its congested junction with Cricklewood Lane. And you'd now be on the wrong side of the Thameslink Line, if you were trying to get to the West End or Kilburn. Appalling, of course, if Brent Cross Cricklewood is actually built in the way now envisaged. Again, redeveloping this area has been talked of for decades, with no action. The current plans have been "called in" by Eric Pickles, Secretary of State for Local Government, so he has the final say over what happens (though this might not be significant). I've heard talk in the GLA of "re-masterplanning" the area again, so the developers may not get what they expect at the moment. It is quite strange that TfL seem to have been so accepting of the proposals thus far, considering they will not only block cycling, but mess up the bus routes up and down the A5 (a very major bus corridor), by forcing the buses to waste minutes going round this new mega-gyratory as well. It's almost as if TfL haven't really studied the implications of what they are being asked to build. I don't expect anything to happen here in the near future. What is happening now, however, is a huge expansion of housing on, and close to, the A5 north of Stapes Corner. Colindale and Burt Oak are earmarked in the Mayor's London Plan as major areas where new housing growth is expected, and at the same time much of West Hendon is being rebuilt, and areas of north Cricklewood along the A5 (seemingly unconnected with the "regeneration" plans). Much of the length of the A5 between Colindale and Burnt Oak town centres is currently a building site, and what is being built is huge blocks of flats, on the site of old industrial and warehouse land. This area of London, which previously consisted mainly of areas of semi-detatched housing with large gardens separated by extensive industrial and brownfield areas, is going to have a far higher population density than ever before, and yet the transport infrastructure is not changing. The Northern Line (Edgware Branch), which provides the main service for these areas into town, also known as the "misery line" because of its bad performance, low capacity, slowness, and outdated equipment, surely cannot be improved enough to cope with a greatly increased demand. In any case, it only provides for radial journeys; orbital journeys have to be made by car, bus (very slow) or bike. There seems no chance of trams or light rail coming to North London, following Boris Johnson's cancellation of Ken Livingstone's Kings Cross tram restoration scheme (which was not on this axis anyway), and campaigners have so far fought in vain to get orbital light rail included in the Brent Cross Cricklewood regeneration plans. Huge new housing blocks currently going up on the A5 between Colindale and Burn Oak town centres: on the left, redevelopment of the former Wickes site, on the right, of the former Boosey and Hawkes warehouse. How are all these people who are going to move in to the area going to get around? Even more polluting buses on the A5, stuck in the queues? More cars in jams at each signalised intersection? With no meaningful space for cycling planned, despite the obvious wasted space on the A5, and no cycle-friendly junctions, I can't see cycling growing to make any significant contribution. There's a housing plan, but no transport plan to go with it, that I can detect. We are currently building to European inner-city densities here, but without providing European-style transport solutions. The A5, axis of all this redevelopment, remains as grim and shabby as ever, a monument to borderland neglect, split governmental responsibility, market forces short-sightedness, public authority issue-avoidance, community disengagement and mis-planning. It almost makes you like planning, doesn't it, for the lack of it. Broad, shabby, little-used pavement on the A5 in the wasteland between Cricklewood and Staples Corner. Any legal cyclists on the road are squashed into narrow lanes here and passed with inches to spare in quiet times. In busy times they are stuck in queues unless they bunny-hop the kerb. The 3 assocs 1984 letter isn't strictly accurate. There is another crossing, at Templehof Av, and it's shown on their map. It's not particularly anymore pleasant though, and is genuinely too narrow for retrofitting. You suggest that motor traffic on the A5 is reduced in the town centre areas to the north and south. The obvious corollary is that there'd then be no need for an interchange at Staples Corner West at all and both A5 flyover and gyratory could be ripped out. Motor traffic would access the A406 via the A41 and Staples Corner East, or the business parks to the west of the A5 could access the A406 directly and not interfere with the personal traffic on the A5 at all. Of course you're only mentioning a small section of Watling Street, even in London. Wouldn't it be a wonderful tribute to the legions for it (the modern route might run A5-A40-Southwark Bridge-A2-A207) to be pleasant and usable? I've just found your website as I was watching John Betjeman on iPlayer part of the BBC 4 Collections - 'Contrasts - Marble Arch to Edgware'. In this he follows the Edgware Road, and when I watch these classic programs I always like to pause, and Google the area, using satellite and street map to see what has changed. I was stumped though when he was in a then brand new built building somewhere near Colindale. It was not until the end of the program he mentioned 'Merit House' so I Googled it and found your website amongst the entries. Funny how things happen and one finds themselves at a place they would never have otherwise known about. I see Merit House is now being 'done up' but what with images of today and his film when it was not even occupied, a nugget of history there too. But of course your all about cycling and I have not long (earlier in the summer) begun cycling again. I hire Barclays Bikes and do what your not meant to - ride a long way over a few hours - my next adventure to go from London Bridge, following the Thames as close as I am able to Woolwich, get the ferry over the other side then cycle back to London Bridge - a very large circular route if you will. I have already done a smaller one from London Bridge to Greenwich and under the Thames back to London Bridge. Anyway you've got a great website and I will go through things in more detail over the coming days. Ugh just looking at the pictures it's car heaven round there. For anyone that loves sitting in traffic jams and taking an absolute age to get anywhere. Sitting here I can all too readily conjure up the taste of the pollution on my tongue. The jump to a mental picture of transport in Holland or say Munich seems too much of a jump but I'm sure their planners were up against the same forces many years ago.